Introduced in the Fall of 2012,Holly Berry is the third in a series of Steiff Christmas bears. Steiff introduced the Holly Teddy Bear in the Fall of 2012 as the third in a series of Christmas Bears. First was Christmas Rose, followed by Mistletoe, and this year it is Holly Berry. He is almost 12 inches tall, and made of a sand colored Alpaca. He is 5 way jointed and does not have a growler. Like all Steiff bears, he was hand-made in Germany. 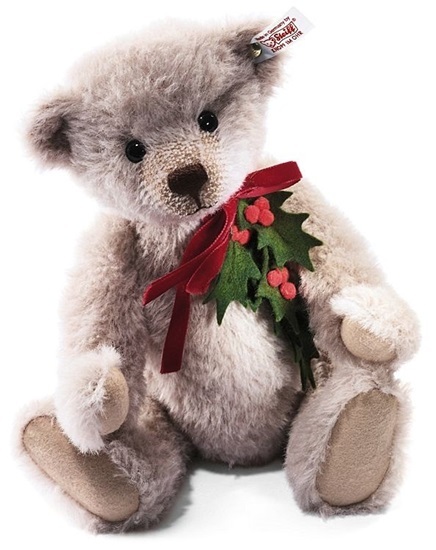 The Holly Berry Teddy bear wears a sprig of beautiful felt holly around its neck. Crafted by hand in Germany, this special decoration will impress you with its intricate detail - careful stitching and delicate airbrushing. The holly berry plant was once believed to ward off evil from one’s home. Now, it’s considered an almost universal symbol of Christmas. Holly Bear is a Worldwide Limited Edition of 1500.